ESA’s miniature satellite PROBA-V may only be as large as your average dishwasher, its potential in Earth Observation is inversely proportional. Providing images on a daily basis in a spatial resolution of 100 m, 300 m and 1 km, PROBA-V serves a niche market. Combine its valuable data sets, revisit time, complementarity with satellite data such as SPOT-VEGETATION and the Sentinel missions, and the new improved Mission Exploitation Platform (MEP), you have a series of invaluable tools at your disposal to explore our planet to infinity and beyond. This weekend it’s time to celebrate as PROBA-V gets to blow out 4 candles. The small satellite was launched in on May 7, 2013 in Kourou, French Guiana. And this is not the only reason to celebrate. With an original lifetime of 5 years, PROBA-V now raises the bar by extending its operational services till at least the end of 2019. Launched in May 2013 with an original operational lifetime of 5 years, PROBA-V now raises the bar and adds another 1.5 years to its lifetime. The platform availability is still of superior quality with no signs of degradation, geometric and radiometric performances are well within requirements and all infrastructure and protocols are in perfect condition. All the more reason to keep observing the Earth and providing valuable EO data till at least the end of October 2019 to more than 800 institutions or companies, representing more than 100 nationalities. The importance of PROBA-V within the ESA optical sensors’ family is clear. Ever since the launch of the Sentinel-2 and Sentinel-3 missions, PROBA-V plays a key role for testing the synergistic use of medium and high resolution satellites as well as sensor inter-calibration, Cal/Val and performance assessments. Additionally, PROBA-V’s 100 m products fill a niche of interest between high resolution sensors with a lower revisit time (Landsat & Sentinel 2) and moderate resolution sensors with a daily global coverage (e.g. MODIS or PROBA-V 300 m/1 km products). Several studies have also shown the potential of data fusion techniques, jointly using high and medium spatial resolutions satellites. Pivot irrigation is a common agricultural practice aiming to nourish the world’s growing population and livestock. This 100 m PROBA-V timelapse of 100m PROBA-V imagery shows the almost breathing agricultural area of Wadi as Sirhan Basin in Saudi Arabia from 2014 to now, highlighting the irrigated fiels in red, in sharp contrast to the surrounding, yellowish desert sand . Notice the growing amount of fields in the northeastern region over the course of the last three years. Click here to view more stunning time-lapses. PROBA-V was designed to extend the data set of the long-established Vegetation instrument aboard the SPOT-4 and SPOT-5 satellites. In the meanwhile, a global continuous EO data archive of nearly 19 years is a fact. Providing historic and current data is essential for many applications such as climate change monitoring, agricultural monitoring, land use studies, coastal and inland water monitoring, global environmental monitoring, etc. Driven by the large user base and wide variety in applications, several initiatives have already been taken to guarantee continuity of these valuable time-series past mission end-of-life. Patty Smith already predicted the future in 1988. People can unleash the power of the VITO Remote Sensing Hadoop cluster on the SPOT-VGT and PROBA-V data, for free! Users can analyse the data and discover the full potential of the Vegetation time series. Let’s skip the long download time, and save on local storage and processing investments. The entire PROBA-V archive and 1100+ processing cores are at your service in the Mission Exploitation Platform! So this weekend we are celebrating more than just PROBA-V’s 4th birthday. After 4 successful years we’ll keep providing more and more valuable EO data, improved data access and the best possible operational service. To celebrate all together, we want to share 4 stunning time-lapses that show you how our Earth has changed over the past years. Check them out on the new PROBA-V website and see the power of EO data. Judging by the age of its elderly family members (PROBA-1 & PROBA-2), it still has a long life ahead. Follow us on Twitter to stay informed! 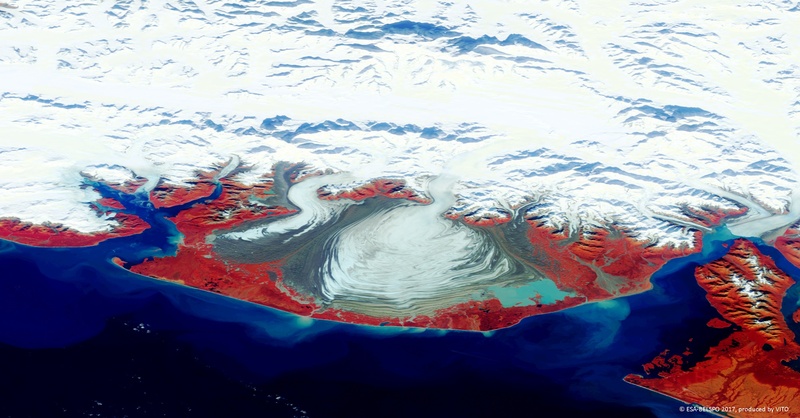 Thanks to the daily global observations, PROBA-V is able to capture several rare cloud-free pictures of Malspina glacier, the largest piedmont glacier that is located in southeastern Alaska. Due to its vast size, that is estimated as 3900 km² with a depth of 600 m, the melting of this glacier could contribute up to 1% of the rise of the global sea level, as evidenced by satellite imagery and radar data. Click here to view the time-lapse of the Malaspina glacier.